It isn’t only the poker pro’s that we hear about getting these insane hands, making the biggest and wildest bluffs, or simply getting the luckiest river card. It seems that professional soccer player for the Brazil national team, as well as for FC Barcelona, Neymar Jr. truly does enjoy playing. Ever since Neymar joined PokerStars in May, he has been making his rounds around the tables, and participated in many events and tournaments. His latest exploit comes during an online tournament he was playing on at PokerStars.es. Right before the amazing occurrence he was in Spain, where he was hosting his very own charity tournament to benefit his foundation, the Neymar Jr. Project Institute, at the European Poker Tour (EPT) Barcelona Festival. The institute is run in order to help poor Brazilian families and their children, as it helps them with education, and has partnered up with the FC Barcelona Foundation to continue promoting and helping. During his time in Spain, he participated in an online tournament at PokerStars.es, which is where this amazing feat was achieved by him. 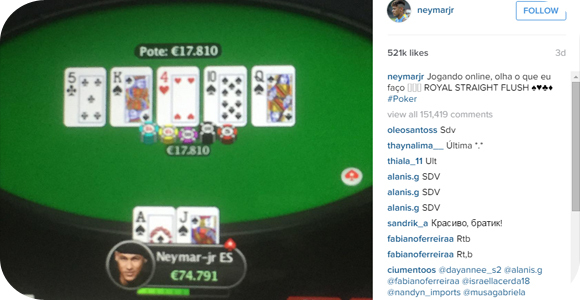 Neymar Jr. hit a Royal Flush, to the amazement of not only himself but every one of his followers on twitter; not to mention the other players at that table he took €17,810 from. Just to give you some perspective on how lucky or amazing or nearly impossible it is to get a royal flush is, the odds of hitting one is 30,939:1. So, this goes to prove that not only is he a genius on the soccer field, but he isn’t too bad at poker either. If you frequent the online rooms, you may see him in there playing, as he is currently recovering from the mumps, and will have plenty of time to spare while he recovers fully and returns to his regular practice.